A girl embraces the coffin with the body of Yalid Jimenez, 29, who died Sunday during the clearing of the highway in Nochixtlan, Mexico, June 20, 2016. Violence erupted during the weekend in confrontations between the police and striking teachers. 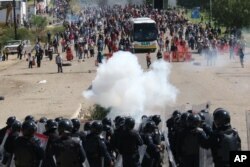 Violence erupted Sunday when police dislodged protesters blocking a highway in the southern state of Oaxaca, a hotbed of dissent from radical teachers' groups opposed to education reforms pushed through by the government three years ago. Speaking on local radio early Monday, Jorge Ruiz, Oaxaca's state secretary for public safety, said eight people died in two separate confrontations, raising the death toll in the clashes from a previous tally of six. Riot police battle with protesting teachers who were blocking a federal highway in the state of Oaxaca, near the town of Nochixtlan, Mexico, June 19, 2016. The violence came as Christof Heyns, the United Nations' Special Rapporteur on extrajudicial, summary or arbitrary executions, said Monday that police accountability in Mexico was insufficient.